I found some really nice fresh squid in Karstadt this week – on an unsuccessful trip to buy a sugar thermometer . 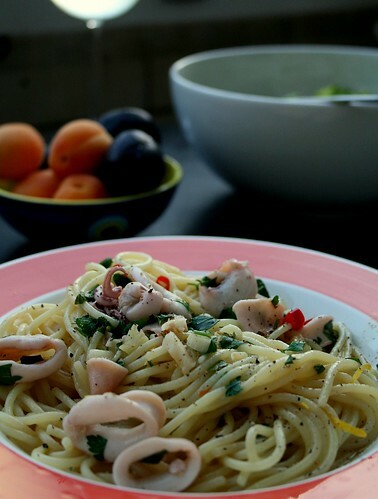 It was a hot day so a light evening meal was called for, and Jim suggested a twist on my favourite Spaghetti Vongole. Put the spaghetti water on to boil. Clean and prepare the squid – there’s a good video here showing you how to do it. Slice into rings, leave the tentacles whole. Add the spaghetti to the (now boiling) pan with a drop of olive oil. Heat a griddle pan to fairly hot and add the squid; leave it for a couple of minutes (if that) until it’s turned an opaque white colour, turn it over an give it a minute or so more – you really don’t want to overcook squid it goes really rubbery. 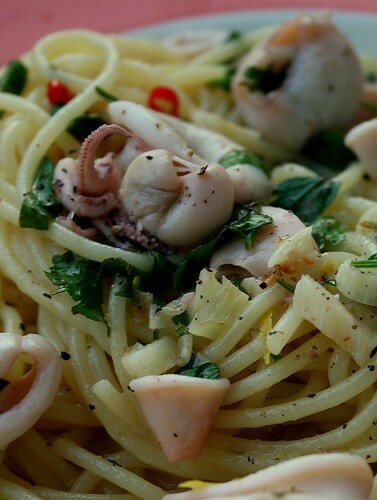 Throw the cooked squid into the olive oil-lemon-parsley mix. Heat a little olive oil in the (now empty) pasta pan and fry the garlic, chillies and lemon zest together for a few minutes. Add the spaghetti, squid-parsley-oil-lemon mix and a cup of dry white wine to the pan. Give it a few second to heat through and the alcohol to evaporate. Add salt and pepper and check to see if it needs a touch more lemon (or serve lemon wedges on the side). With the day being as hot as it was we ate ours on the balcony with a green salad and white-wine spritzers, followed by some fresh apricots and plums. Does anyone know where I can buy a sugar thermometer in Berlin? I’m planning on making some jam with the last of this summer’s fruit; and trying out some of Dan Lepard’s caramel recipes.